Dr. Babalola is an experienced geoscientist with a multidisciplinary background in geology, strong knowledge and competence in sedimentology, micropaleontology, palynology and environmental geochemistry. 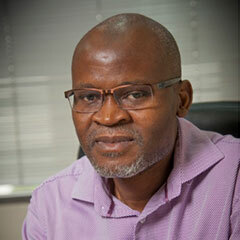 He possesses over 20 years of academic and industrial experience. He originally graduated in 1985 from The University of Ilorin, Nigeria with a BSC (Honors) in Geology and this was further supplemented with his graduation from KFUPM in 1999. In 2009, he secured a Ph.D. Geology from Carleton University in Ottawa, Ontario, Canada. Ph.D., Geology, Carleton University, Canada, 2009. M.Sc., Geology, KFUPM, KSA, 1999. M.S., Applied Geology, Obafemi Awolowo University, Nigeria, 1992. B.S., Geology, University of Ilorin, Nigeria, 1985. Geology, Sedimentology, Micropaleontology, Palynology and Environmental Geochemistry. Babalola, L.O., Kaminski, M.A., Patterson, R.T., and Natalia Vazquez-Riveiros, N., The wall structure of the agglutinated foraminifer Eggerella advena: its reassignment to the genus Eggerelloides, and description of Eggerelloides belizensis n.sp. submitted to International Workshop on Agglutinated Foraminifera. Chan, S.A., Malik, M.H., Kaminski, M.A., Babalola, L.O., Optimization of the Acetic Acid method for microfossil extraction from lithified carbonate rocks: Examples from the Middle Jurassic Dhruma Formation and Middle Miocene Dam Formation in Saudi Arabia. Submitted to Arabian Journal of Geosciences. Eltom, H., Abdaseed, K., Abdulraziq, A., Babalola, L.., Makkawi, M., Abdulatif, O., Incorporating multiple scenarios of porosity evolution into a three-dimensional outcrop reservoir analog model: a case study of the Upper Khuff Formation oolite carbonates, central Saudi Arabia. Accepted Journal of Petroleum Engineering & Sciences.